Add some science fiction, some fantasy, tons of action and adventure and one spectacular and unrivaled cast and what do you get? You get the masterpiece of a film that is KIN. This movie is bound to have you at the edge of your seat the entire time. It’s captivating. It’s jaw-dropping. And, it has a touching, underlying message that there is no stronger bond than the bond of kin. This epic movie is written and directed by the genius twins: Jonathan Baker and Josh Baker and it originated from the short film they created titled, “Bag Man.” It’s so brilliant to see how these two masterminds were able to transform their short film into a full-blown, exceptional movie that should definitely have a sequel and many more movies after that to continue to tell this stellar story. KIN follows Eli Solinski, an adopted son of Hal Solinski (played by Dennis Quaid). In the beginning of the movie, we find out that Eli, portrayed by the immensely talented Myles Truitt, is suspended from school after getting into a fight with a student who was talking about his late mom (Hal Solinski’s late wife). Eventually, Eli wanders about an old factory where he finds dead bodies of soldiers from a different dimension. He also comes across a futuristic-looking weapon that he brings along with him. Later on, Hal Solinski’s biological son Jimmy returns home after being incarcerated for six years. After a not so pleasant family dinner, Jimmy (played by Jack Reynor) visits Taylor Balik, a gangster who always has his gun by his side. Balik, played by James Franco, threatens Jimmy to pay him back the whopping $60,000 he owes them for keeping him safe while in jail; and if he doesn’t get the money to Balik and his crew immediately, then Jimmy and his family will find themselves in danger. Tensions among the Solinski household reach a pinnacle when Jimmy asks his father if he can have the $60,000 in his dad’s office safe. Things take a turn for the worse when Jimmy decides to take matters in his own hands and he winds up getting into even greater problems with Balik and his deadly squad. Before too long, Jimmy persuades Eli to go on a road trip with him to escape from Taylor Balik’s wrath. The two brothers find themselves on a hazardous journey and are later joined by another person, Milly, played by Zoë Kravitz, who is yearning for an escape too. Together, the trio embarks on a life-threatening adventure where not just one, but two, groups of individuals are in search for them. There truly is never a dull moment in this fast-paced film. If you’re into crime-thrillers, this movie is definitely for you. If you love some sci-fi action, KIN is totally calling your name. And, if you’re in the mood for a movie that stars one of the most highly-acclaimed casts filled with consummate actors and actresses, this film is one that you should be rushing to the movie theater to see. KIN is a movie that appeals to everyone and plain and simple, it will have you #shook to the core. 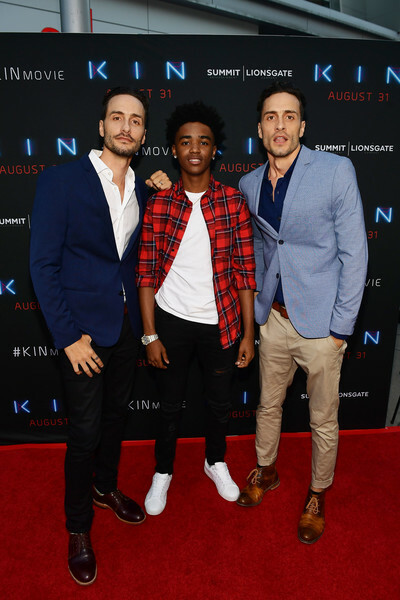 A marvelous premiere of Summit Entertainment and Lionsgate’s KIN took place at the ArcLight Cinemas Hollywood in Hollywood, California on August 29, 2018. Celebrities, including the film’s very own Myles Truitt and directors Jonathan and Josh Baker had a terrific time seeing this outstanding film up on the big screen. The cast and crew’s hard work on this one-of-a-kind project is definitely evident in this magnificent movie. A wonderful after-party to celebrate the success of KIN took place at the Avenue. I, Alexisjoyvipaccess had an extraordinary time attending the premiere of KIN and I am definitely one of the many people rooting for this movie to become a series. It’s a film that I couldn’t stop talking about after I watched it and I have been encouraging people to go out and see it. It’s one of those movies that I will never forget and I can’t get over how much of an incredible and awe-inspiring job the whole cast did to bring this movie to life. Check out some more pictures from the Los Angeles premiere of KIN below and be sure to go out and see this fantastic movie out in theaters now! Previous Article: Join In On All Of The Fun As Nickelodeon’s “Double Dare” Embarks On A Multi-City Tour Across The U.S. – See The Tour Dates Here! Next VIPAccessEXCLUSIVE: The Rockwell Table & Stage’s Unauthorized Musical Parody Of… “Bridesmaids” Is The Wedding Party You’ll Definitely Want To Crash – RECAP Here!